We see through the cornea, which is the clear, central part of the front surface of the eye. Normally, the cornea has a dome shape, like a ball. Sometimes, however, the structure of the cornea is just not strong enough to hold this round shape and the cornea bulges outward like a cone. This condition is called keratoconus, and keratoconus eye disease treatment can range from new glasses to custom lenses. Keratoconus appears to run in families. If you have it and have children, it’s a good idea to have their eyes checked for it starting at age 10. The condition happens more often in people with certain medical problems, including certain allergic conditions. It’s possible the condition could be related to chronic eye rubbing. Most often, though, there is no eye injury or disease that can explain why the eye starts to change. The changes can stop at any time, or they can continue for decades. In most people who have keratoconus, both eyes are eventually affected, although not always to the same extent. It usually develops in one eye first and then later in the other eye. Can Keratoconus Damage Your Vision? 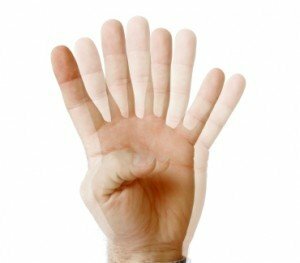 The changes to the cornea can make it impossible for the eye to focus without eyeglasses or contact lenses. In fact, a corneal transplant may be needed to restore vision if the condition is severe. Laser vision correction surgery — PRK Eye Surgery – can be dangerous for people with Keratoconus. Early detection scenarios have been unique cases where surgery was effective. As the cornea changes from a ball shape to a cone shape, the smooth surface becomes slightly wavy. This is called irregular astigmatism. As the front of the cornea expands, vision becomes more nearsighted. That is, only nearby objects can be seen clearly. Anything too far away will look like a blur. To be sure you have keratoconus, your doctor needs to measure the curvature of the cornea. There are several different ways this can be done. One instrument, called a keratometer, shines a pattern of light onto the cornea. The shape of the reflection tells the doctor how the eye is curved. There are also computerized instruments that make three-dimensional “maps” of the cornea. 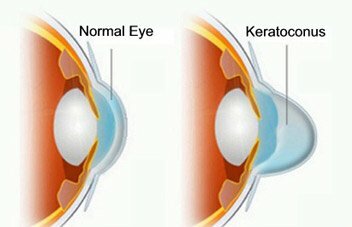 Keratoconus eye disease treatment usually starts with new eyeglasses. If eyeglasses don’t provide adequate vision, then contact lenses may be recommended. With mild cases, new eyeglasses can usually make vision clear again. A new approach to keratoconus eye disease treatment offers the comfort of a soft lens; custom parameters, including cylinder correction to -10.00D; and the kind of straightforward fitting not found in hybrids, Alden Optical’s new NovaKone™ soft lens for keratoconus is it. While NovaKone lenses can be a viable solution for all stages of keratoconus, they’re especially effective for patients with more advanced conditions, those who have failed to tolerate GPs, or who have been unsuccessful with hybrid and scleral lenses. Though some eye care professionals recommend against Excimer laser PRK in patients with keratoconus because it thins the cornea even further, we are actively researching this area. Our experience has shown that in patients who are over age 40 whose vision is stable and whose corneas are thick enough they get similar results with the Excimer PRK as they would get with glasses. Patients who elect to undergo this treatment will be done under an experimental protocol and need to understand that they are at increased risk of scarring with the potential for needing a corneal transplant.